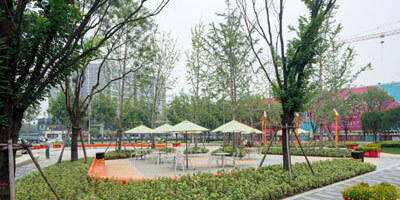 Located near Beijing East Fourth Ring Road, this development has Chaoyang Park in its vicinity. While the architecture is modern, its aesthetic incorporated a rather monumental Art Deco architrave design element onto its facade. 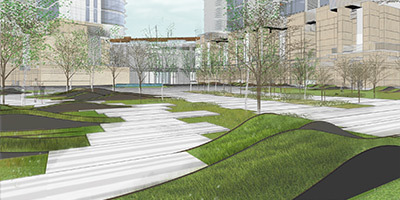 This became the main landscape design challenge as we attempted to redefine and reduce its scale with a subtle modern palette amidst a heavy Postmodern building backdrop. A series of open & intimate landscape nodes & courtyards such as the Tranquil Court, Blossoms Court, Sculpture Court, Boxwood Maze, Activity Lawn, Cypress Maze, Kid’s Paradise and the Labyrinth of Lights is weaved together into a wonderful journey of discovery.